BOYS, DO YOU KNOW WHO’S SHARING YOUR BED? You’ll be hard pressed to find a man that’ll turn down some company come bedtime – but we have to ask the question, do you really know who you’re sleeping with? Bed Bugs may be the cute pet name you use for your bed buddy but take it from us, these little critters are out there and they’re not the after-dark cohorts you asked for. They are, however, ready to get up close and personal! Bed bugs are a growing problem throughout the world, with countries such as the US, England and Australia reporting a spike in infestations. Bed bugs are carried by humans and are being spread rapidly through increased travel. These pests tend to migrate to the mattress or box spring, which is closest to their next meal, you! But wait, there are more nasty creatures lurking in the dark depths of your mattress, allergens and irritants such as dust mites and bacteria can cause health problems and interrupt your valuable sleeping time. Have no fear though, Protect-A-Bed, the world’s best-selling mattress protector, has a range of products to suit your needs, offering the ultimate in protection for you and anyone who happens to be bunking in your boudoir. The product’s patented Miracle Membrane provides the most up-to-date technology in mattress protection that is unique to Protect-A-Bed. This waterproof membrane ensures that the mattress is protected from fluid damage. As well as being waterproof, all products in the Protect-A-Bed range are also breathable as they are not made of PVC. Being fully waterproof is extremely beneficial as most people purchasing a new mattress have no idea that if it is soiled or damaged by any type of fluid it will lose its warranty. Protect-A-Bed has you covered with fitted-sheets designed for all types and sizes of bed. Comfortable, natural cotton towelling over polyurethane film provides superior comfort. Unlike typical mattress pads, these little beauties will not change the feel of your mattress. The fitted-sheet styles provide super stretch, you won’t even know it’s there. In its category, Protect-A-Bed is the ultimate in mattress protection. Through its innovation and uncompromising quality and success, it is now the leading mattress protector in the world. In a market place where there are many choices, Protect-A-Bed is the definitive benchmark in protecting your mattress. So do the right thing and feel confident in the knowledge that you’re using the best protection out there in the war against unwanted bed mates! 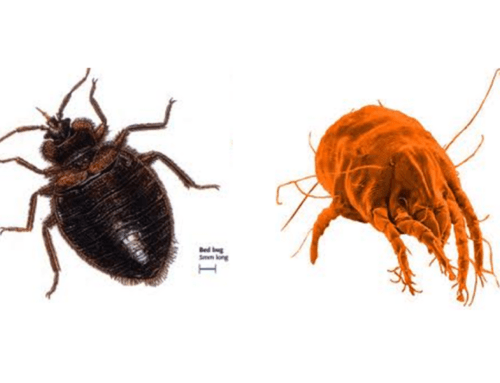 DUST MITES VS BED BUGS – CAN YOU TELL THE DIFFERENCE?